This is a cheater picture ... the carousel horse is printed on the fabric. 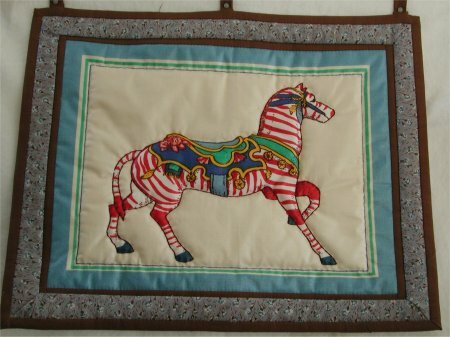 At this point in my quilting life, I still didn't know anything about machine quilting, so I decided to hand-quilt around the outline of the horse and the first printed border line. It actually wasn't such a bad job of outline quilting, although in retrospect, those open spaces probably ought to have been quilted with some sort of decorative design. I machine sewed the 2 borders: the narrow solid brown and blue print borders and repeated the brown for the binding. I put tab hangers at the top of the picture.